So I’ve had many request from users of my Coming Soon and Maintenance Mode plugin on how to automate the enabling and disable of maintenance mode so it could be scheduled. Up until recently I’ve only allow users to set a countdown and have your coming soon or maintenance mode page disable automatically when it reached zero but there has been never been a way to schedule maintenance mode on an ongoing basis. The countdown autolaunch feature worked in those situations when you wanted to launch your site at a specific date time but did not work for those instances where you needed to put WordPress into maintenance mode to perform some business procedure or update. With the release of Coming Soon Page Pro 5.4.0 I’ve added to new url end points in the plugin that can be pinged manually, by cron or by a remote service to automatically put your WordPress site into Maintenance Mode. Let me show you how it works. What you want to do is composer a url like the examples below. Pass in your License Key and mode and this will automatically put your site into one of the modes listed below. What’s great about this is you can manually enter this url, create a cron job on your local server to run on a schedule or use a 3rd party service like http://cronless.com/ or https://zapier.com to ping the url to meet your needs. I’m also considering adding WP-CLI support. Let me know if you’d like to see a package for WP-CLI. 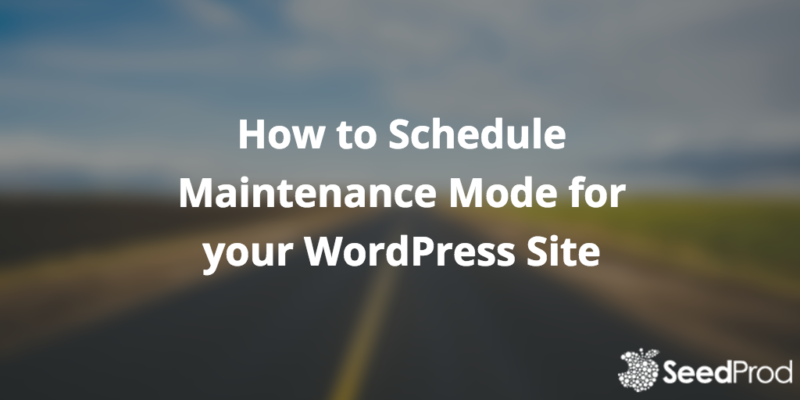 3 thoughts on "How to Schedule Maintenance Mode for your WordPress Site"
I would definitely be interested in a WP-CLI interface to this. I have a number of cron jobs that run WP-CLI command so this would be great. How do I enable the Redirect function with the cron job? I’m going to try “mode-3” and see if that works….